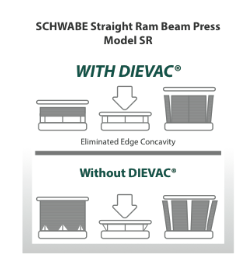 The innovative SCHWABE Straight Ram Beam Press with progressive feed, with the DIEVAC® System (developed by Ontario Die International), specially designed and engineered for large volume die cutting & manufacturing of Automotive Interior Parts and Trim components. 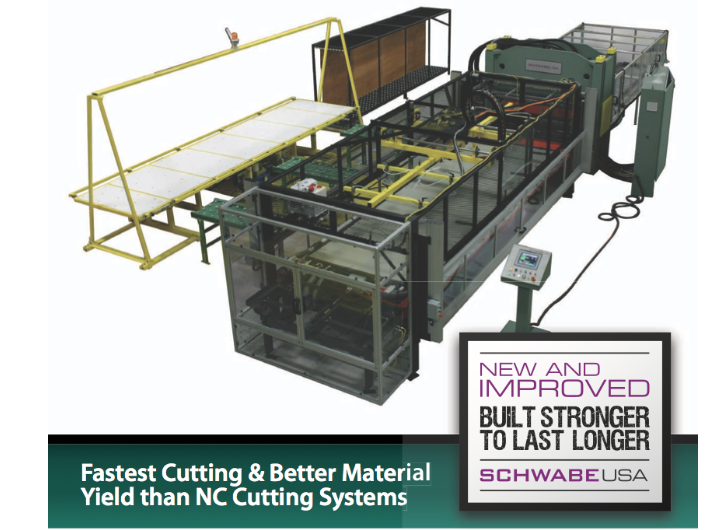 SCHWABE USA Cutting Press – New & Improved +25% Faster / Lowest Cost Operation for cutting manufacture of high volume Auto Interior Parts / Trim Manufacturing. Pattern complexity immaterial to productivity. All interior blades and punches cut simultaneously. Each ply is consistently cut, top to bottom. New & Improved +25% FasterLowest Cost Operation for cutting manufacture of high volume Auto Interior Parts / Trim Manufacturing. Sponge or foam filled material. 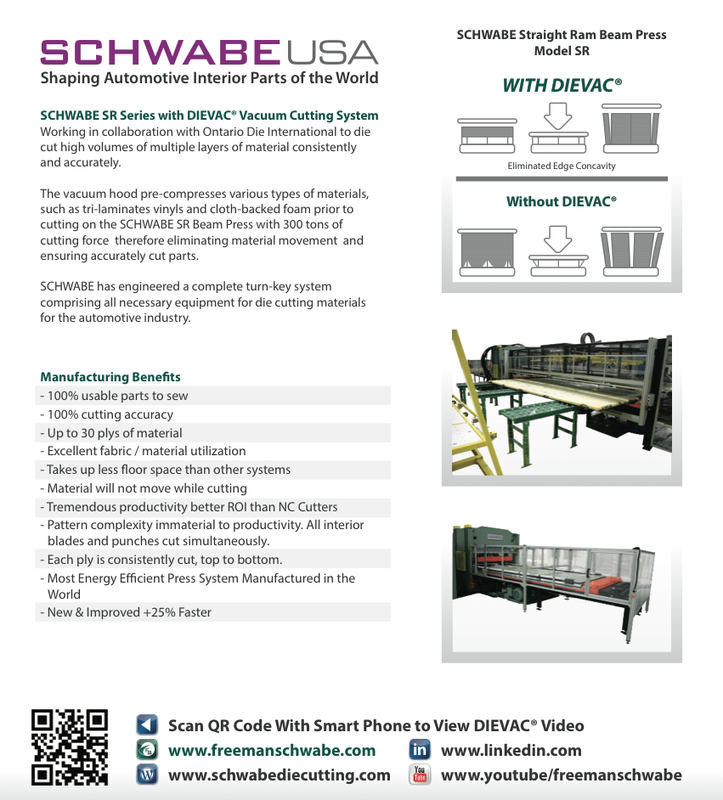 Fast, smooth and 100% efficient vacuum of the die & material shroud / hood. Rugged and Heavy-duty powered die chase with 25% faster cycle time. Capable of cutting die boards up to 18 feet / 6 metres long. Features Power Table Die Transfer into the Press and out of the Press after Cutting. Smooth and efficient and labor saving. Assures perfect loading of die board and material in repeatable fashion. Up to 20″ of material stack height is possible; under vacuum compression each part is perfect every time! 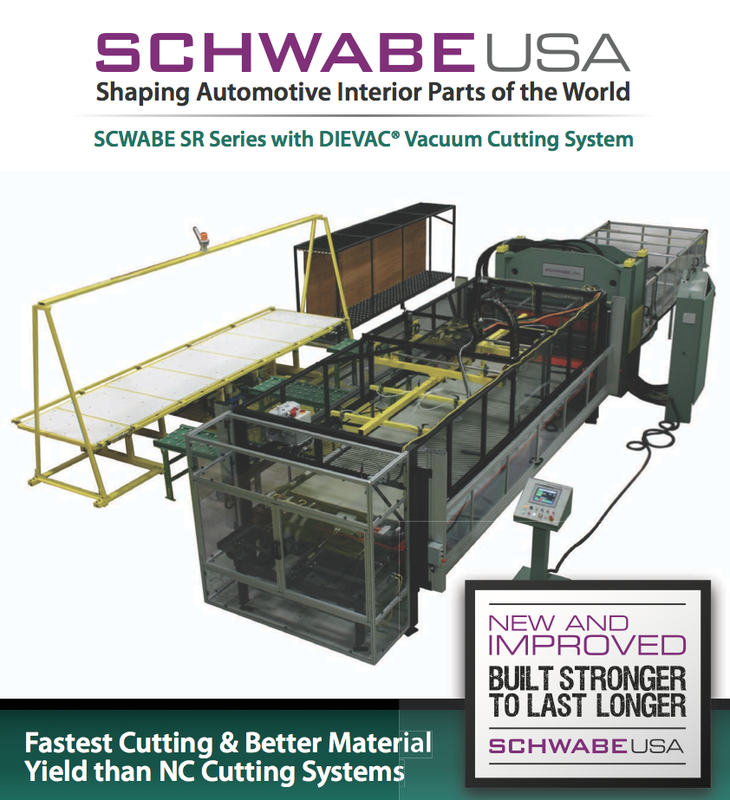 This entry was posted in Auto Interior - Seat Covers, Automotive Interior, Schwabe Auto Interior (Chinese), Schwabe Automotive Interior, SCHWABE SR with DieVac System and tagged Auto trim cutting, Cuts Auto Trim Faster, Schwabe SR Press with Die Vac. Bookmark the permalink.